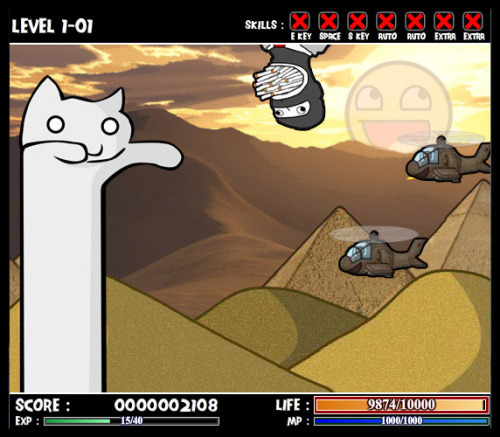 Lead Longcat through the levels by shooting any incoming threat and defending yourself with your shield! Try to survive for as long as possible to get an hiscore, and, who knows, maybe beat the game and accomplish the prophecy of Catnarok! Mouse + hold click = aim and shoot basic attack E = use eye laser attack (once unlockjed) S = activate/deactivate shield (once unlocked) R = activate rage (once unlocked) Spacebar = Shoop Da Woop mouth cannon Weird sideschroll shooter game sequel.